615 sq. in. of cooking area. 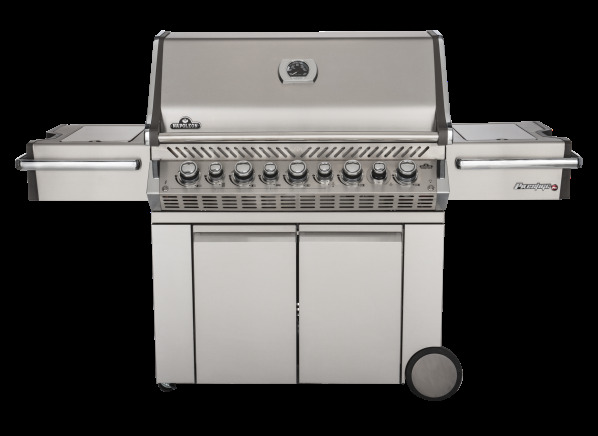 The Napoleon Prestige Pro 665RSIB is part of the Grill test program at Consumer Reports. In our lab tests, Grill models like the Prestige Pro 665RSIB are rated on multiple criteria, such as those listed below. Evenness performance: Evenness of heating over the grill's surface at the highest and lowest setting using all main burners plus the evenness after a 10 minute preheat, using thermocouples. Results in the following chart are gathered from Consumer Reports’ 2018 Fall Survey of 38,002 free-standing, full-size gas grills owned by members who purchased a new unit between 2008 and 2018. Our predicted reliability ratings are based on a statistical model that estimates problem rates within the first 5 years of ownership, for grills that are not covered by an extended warranty or service contract. We also adjust for the number of hours of use during the summer of 2018. The median number of hours of use during this summer was 20. Higher ratings are indicative of better reliability. Brands receiving a red or orange rating cannot be recommended by CR at this time. Our owner satisfaction ratings are based on the proportion of members who are extremely likely to recommend their grill to friends and family. All or mostly stainless All or mostly stainless Includes more than just a panel or other trim. Based on our limited tests, nonmagnetic stainless is less likely to corrode. Long-warranty burners Long-warranty burners While burners remain the grill's most-replaced part, most are warranted for only 3 to 5 years. Better burners are covered for 10 years or more. Side burner Side burner A side burner, which resembles a gas-stove burner and has its own heat control, is handy if you want to cook vegetables or sauce without leaving the grill. A side burner could also be an infrared burner used for searing. Infrared burner Infrared burner Gas burner that uses infrared technology (ceramic burner, plates and screens, or troughs as some examples) for cooking. An indirect flame is used for cooking food. Burner can be located as the main burner, side burner, rotisserie burner, or any combination of burners. Rotisserie Rotisserie This generally means that the grill comes with a dedicated rotisserie burner; the motor and spit are usually purchased separately. A dedicated rotisserie burner is usually located on the back of the firebox, slightly above the cooking grates; some models use the grill's main burner(s). This feature allows you to roast meat (a whole chicken, for example) very evenly, yielding a flavor that some people prefer to that of grilled food. .
Side shelf material Side shelf material Shelves are usually made of stainless steel or painted steel (some using a powder-coating process), though a few are made of plastic. Plastic and stainless steel may prove more durable than paint coatings. Fuel gauge Fuel gauge Located on the propane tank or the grill itself, this reveals at a glance how much propane remains in the tank. Comes with griddle Comes with griddle Comes with griddle. Additional features Additional features Additional features can be a cover, lights, towel racks, bottle opener, utensil hooks, etc. Stainless-steel grates Stainless-steel grates Primary cooking grates made of stainless-steel are generally sturdier than those made of coated steel and resist rust even without a porcelain coating. Coated-cast-iron grates Coated-cast-iron grates The grill's primary cooking grates may be made of porcelain coated cast-iron, which generally sears meats better and keeps grilling temperatures more consistent than grates made of porcelain coated steel. The porcelain coating usually makes such grates easier to clean than other surfaces, and the grates should resist rust as long as their porcelain coating isn't chipped. Size category Size category Size category for the grill, based on CR's measurement of the main cooking grid area. Portable grills are grouped together regardless of cooking area, though typically these are small grills. Measured cooking grid area (sq. in.) Measured cooking grid area The main cooking area of the grill rounded to the nearest 5 sq. in. Not including any searing burners in the main cooking area. Exterior dimensions (HxWxD) Exterior dimensions The exterior measurement of the grill with shelves. Shelf space Shelf space Shelf space rounded to the nearest 5 sq. in. Number of main burner controls Number of main burner controls Most small and average-sized grills have two separate burners, controlled independently, or one burner with independently controlled halves. Some average-size grills have up to four burners with corresponding controls; large grills often have six. Additional burner controls generally allow the cook more flexibility. Main burner Main burner Main burner BTU/Hour. Side burner BTU/Hour Side burner BTU/Hour Side burner BTU/Hour. Rotisserie burner BTU/Hour Rotisserie burner BTU/Hour Rotisserie burner BTU/Hour. Igniter type Igniter type Most grills have a mechanical igniter of either the push-button or rotary design. More convenient is a battery-operated electronic igniter, which usually ignites the gas on the first try. Some grills also have lighting holes, on the side of or beneath the grill, that can be used with a match should the igniter fail. Wheels and casters Wheels and casters Most carts have two wheels or casters on one end and two casters on the other. Other models have just two wheels: you lift one end to move them. Wheels with a full axle are better than those bolted to the frame, which may eventually bend. Natural-gas version available Natural-gas version available Many gas (that is, propane gas) grills also come in a natural-gas version, usually with a different model number that includes an "N" for natural gas. Some models have a conversion kit (as standard or optional equipment) that requires some modification to a propane grill in order to use it with natural gas. If you're unfamiliar or uncomfortable with these modifications, you may need to hire a professional to do the job; your retailer should be able to help with arrangements. The grill also would, of course, require its own gas line. Bare-cast-iron grates Bare-cast-iron grates The grill's primary cooking grates may be made of bare cast iron, which generally sears meats well and keeps grilling temperatures consistent. Bare cast iron, however, must be kept oiled to prevent rusting. Such grates are also usually more difficult to clean than other surfaces. Coated-steel grates Coated-steel grates Primary cooking grates made of porcelain-coated steel will resist rust as long as their porcelain coating isn't chipped. Porcelain-coated grates are also usually easier to clean than other surfaces. But coated-steel grates typically do not sear meats as well or keep temperatures as consistent as sturdier grates made of cast iron or stainless steel.